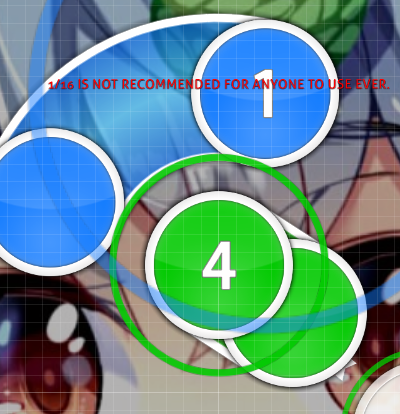 ZUN - Manatsu no Yousei no Yume · forums · community | osu! No that cs is too big and awkward to follow the patterns i'm going with for my normal diff. i wanna stick with the old style rather than the new and modern style in this case. stack leniency higher 0.9 and lower 0.3 is better What do you mean with that? Only diff that has 0,2 stack leniency is insane and its totally fine there imo, especially since it would mess up the patterns and make stuff harder to read so ill keep the 0,2 there. the flow is look so straight that. 01:04:572 (1,3) - exchange better? Dont really like that..
or 01:06:715 (1,2,3) - this three use the note Dunno about that. I mean its still a circle here and the fact that it starts with a jump to the next note makes this emphasize it already imo. not sure why first section of the map uses Normal sampleset whilst rest uses soft. 00:40:286 (1,2) - since this sounds the same as 00:38:679 (3,1) - and 00:37:250 (3,1) - why not the same pattern? 01:18:143 (3,4,5) - downward slider flows better? 01:36:893 (7) - better ctrl+G it or change the whole sliderjumps directions, doesn't flow much imo : Like This? 00:24:572 (1,2) - I prefer (1) downward and (2) upward to make it similar to 00:13:143 (1,2,3,4,5,6) - which is the same melody Well yea its the same melody but here its much more intense. Ill keep it mind but no change for now. 00:56:045 (1,1) - 1/4 halt isn't enough, 1/2 tick instead, feels like ninja spinner Huh? Its after a spinner so id think its fine actually. Ill keep it in mind and if it gets said more often ill change it. 01:30:286 (1,1) - same as 00:56:045 (1,1) - Same as i said already, dont think its a problem since its enough time to spin and a spinner is before this one..
00:04:572 (1,2) - weird overlap with 00:05:822 (4,1) - yes that's true but a linear transition from (4,1) would make it awkward to follow. kinda lacks klai - consider putting it more nope i prefer fountains over extended kiais. i find it more appealing than normal kiai times. 00:04:572 (1,2,3,4,1) - very much tapping here despite being calm part and compare to later intense part which uses sliders a lot. 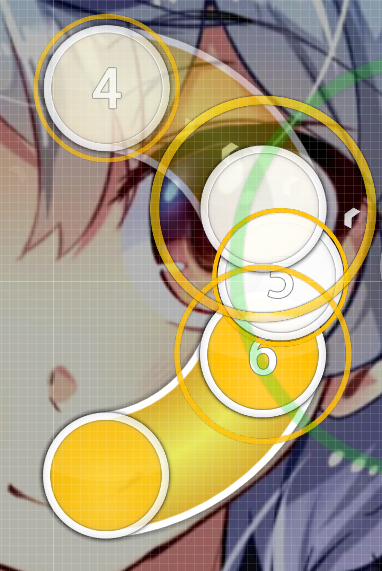 consider change circles into 1/2 sliders for consistency no i wanna give variety here instead of making it consistent. 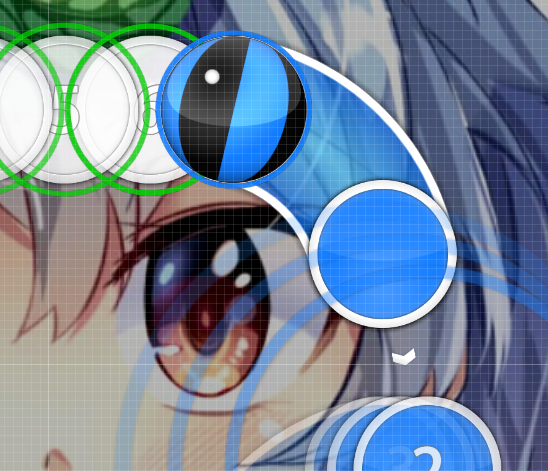 00:31:000 (2,1,2) - change one of these sliders into reverse slider following the beat might be better, these 3/2 sliders seems plain to me no that would feel and play suddenly for players if they're not expecting it. 00:40:286 (1,2) - since this sounds the same as 00:38:679 (3,1) - and 00:37:250 (3,1) - why not the same pattern? again variety. i prioritize variety over consistency in this case. 01:26:715 (2,1,2) - same as 00:31:000 (2,1,2), but I think this one should be a reverse at 01:27:429 (1) - nahh i wanna keep the flow steady in this case. in case you're asking why the sliders at 01:28:858 (1,2) - , it's nearing the end of the song so i decided to make it slightly harder for players. no changes made but ty for the mods. Source: 東方天空璋　～ Hidden Star in Four Seasons. i really love this bgm, and good luck on ranking!! Thank you a lot for this. But do you have any source of this romanised title? 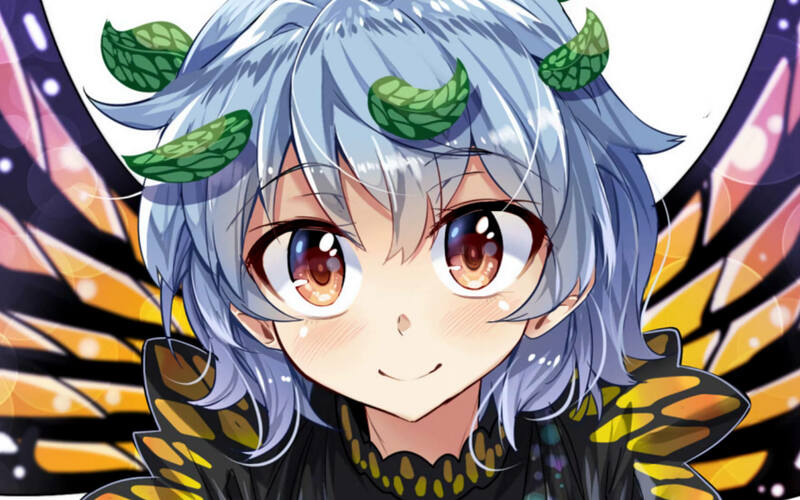 Googling the name will not bring you to anything touhou related but this osu thread so im rlly not sure, while the title i have atm actually brings you to this song..
Hey there. Take a mod. 00:49:304 (2,3) - This double isn't directly under the slider. I think you should change this to make it more consistent with the rest of your map. 00:46:983 (5) - Consider moving this note to the right a bit. It looks pretty messy, but it's a really easy fix. 00:50:822 (3,4,5,6,7) - The pattern here suggests that the sounds are the same, but that's not the case. I think you should make the pattern for 00:50:822 (3,4) - different than the one at 00:51:179 (5,6,7) - . 00:52:965 (6) - The repeat on this slider lands on a significant sound, so consider making it a clickable object. 01:37:965 (2) - While there is a sound here, consider removing this note, since this combo emphasizes other sounds. I don't think you should have an OD of 9. 8.2 would be fine, and it would still fit in with your .2 difficulty settings. 00:34:661 (1,1) - Consider combining these two spinners into just one. You don't need to break them up just to hitsound a clap. 00:46:000 - Flow like this would be better. 00:49:304 (2) - I think you should move this circle up just a tiny bit, similarly to my second point from the Extra difficulty. 00:52:161 (2,3,4) - This pattern is confusing. Consider moving 00:52:429 (4) - out from under the double. 00:53:143 (1,2) - I'm fairly certain that the sound the slider here emphasizes starts where the first hitcircle is. I think you should delete the hitcircle, move the slider backwards one tick, and make it one tick longer to compensate. 00:54:572 - Consider choosing similar rhythms for similar sounds. The sounds from here to 00:55:286 - are very similar to the ones from then to 00:55:911 - , yet one is mapped with a stream and the other in a really good pattern. I think you should drop the stream and use the same pattern you did in that second bit. 00:56:536 (3) - Consider moving this circle up a tiny bit so that you can blanket 00:56:000 (1) - . Like this. 01:29:125 (2,3,4,5) - No need for a 1/4 jump here. I suggest moving the stack to be under the sliderend. 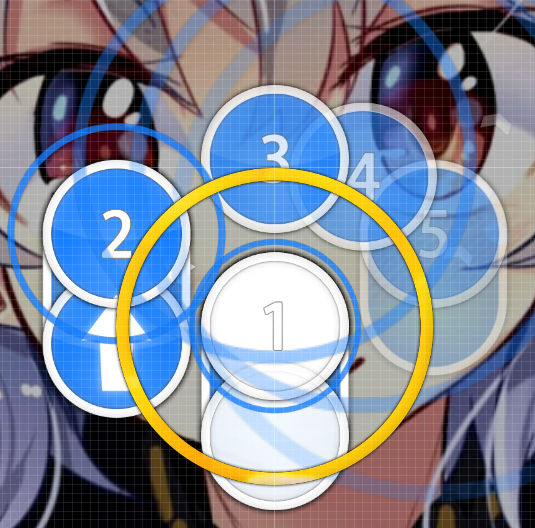 01:32:340 (4,5,6,7) - You could make this look better by moving the hitcircles like this. 01:14:036 (2,3) - I think that two 1/2 sliders could suffice here, starting at 01:13:858 - . You might want to use higher resolution version of that background. Anyway, best of luck. I like the mapping style and how similar it is to older maps. 00:34:661 (1,1) - Consider combining these two spinners into just one. You don't need to break them up just to hitsound a clap. No its 2 spinners because theres 2 different trumpet sounds and not because of the clap ^^ I adjusted the hitsounding though. I didn't expect someone to ask me for a mod from that list, so thanks! As I said, I'll just give my quick opinion on this and Insane. 00:18:858 (1) - This NC feels way unnecesary, this and 00:18:143 (2) - are from the same pattern as you've represented them by just swapping them, so you should't make them different through NC'ing. 00:50:911 (2) - Wait really, What is this? Why would you put a 3/4 slider (BLUE LINE SLIDER?) on a Hard diff? That doesn't really makes sense, anyway it felt really weird to play. 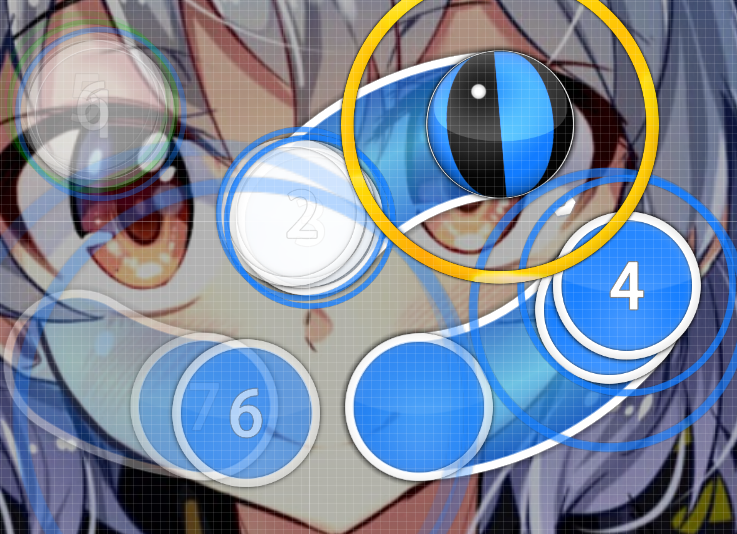 It actually made me choke really hard even thought I can play 6* maps and these things, so I don't think this pattern is good. The next parts of the map are pretty much the same and have the same (as I see them) issues, Just check the consistency and NC patterning thing and you would be ok I guess. I just did a stupid joke with my own name, "Check it out" sounds really similar to "Chekito" oh god am I a Zero Escape-like organization now!? [*] 01:33:143 (2,3,4,5,1) - What do you think about this pattern? I think it would fit better, keeping the zig-zag again but in a different form, also the flow would be better in my opinion. Up to you ye its fine^^ but whats wrong with mine ? Well, it's not wrong but feels like it lacks emphasis. It doesn't feel like you're representing the sounds as you've done before (by two sections with the zig-zag thing), Using this pattern would actually keep the consistency with the previous similar patterns and also emphasize the song in a better way oh ok, ill check it later again andf think about it. theres nothing special in the song here to make this so ill just keep it like i have it i guess..
imo more dense rhythms and stuff like this fit the chorus and the beat of this and thats why i used variations too. I rlly think it fits actually and i dont rlly want to remove it since.. yea its the chorus and it fits imo. Everything where i wrote nothing i fixed it/changed it. Short mod for the Normal diff cause i think visually you can improve some things in your diff. In general im fine with your rhythm choices and a round flowing map is fine for a normal diff in my opinion too, i only got some visual concerns. 00:02:786 (3,4,1) - is literally the only time you made a stack in your diff. to be consitent you should make it linear like the other times you represented this rhythm. 00:04:572 (1,2,3,4,1,2) - that are rly messy overlaps idk how but it would be nice if you make another pattern for this and avoid this overlap. 00:27:429 (1,2,3) - maybe add a note on red tick guess its an important sound you can cover, it will stack on the 2 from before so its a nice addition too. 00:02:786 (3,4,1) - is literally the only time you made a stack in your diff. to be consitent you should make it linear like the other times you represented this rhythm. i'm not being consistent, i'm giving variety here instead...if i make it consistent it'll be repetitive in this one phase in the map. 00:08:858 (1,2,1) - 1 and 1 got a nasty overlap maybe you arrange them new it doesn't affect gameplay that much tbh. 00:27:429 (1,2,3) - maybe add a note on red tick guess its an important sound you can cover, it will stack on the 2 from before so its a nice addition too. that would make it too hard for players due to (1)'s repeat ending at the blue tick. so i wanna keep it safe here. 00:50:286 (2) - maybe move it a bit down so the movement from the last slider leads into this one directly i did something else, similar to what you said. 01:41:715 (3) - repeatmiddle should be a click maybe make two slider out of it the key points in this bit are the organs and i want to emphasize that by using a long 2/1 repeat slider. the circular flow is what i'm going with in this case. i wanna make it linear and readable in this case since i hate the idea of doing sudden transitions and awkward patterning, and some of these overlaps are on purpose. i wanna make it more old style mapping rather than make it modern day style and show players the old style of mapping rather than the new and modern style. many old style maps have overlaps like what i'm doing in this case.